In January, China approved imports of a new genetically modified soybean variety – Enlist E3 soybeans jointly made by Corteva Agriscience, a division of DowDupont and seed company MS Technologies– that can withstand the herbicide 2,4-D.
DowAgrosciences declined to comment for this story. The herbicide – 2,4-D – was one of the active ingredients in Agent Orange and has been shown to drift miles away from where it’s applied. The U.S. used Agent Orange during the Vietnam War to eliminate crops and forest covers for enemy troops. The International Agency for Research on Cancer named the weed killer a possible human carcinogen. Studies have also linked 2,4-D to endocrine disruption, disturbing estrogen, androgen and thyroid hormones. Over the past two decades, a growing number of weeds have become resistant to glyphosate, the most popular weed killer in the world, sold as Monsanto’s Roundup. In response, agribusiness companies, like Dow and Monsanto, have introduced new genetically modified varieties of soybeans that can be sprayed with other herbicides that kill glyphosate-resistant weeds. The United States exports $14 billion worth of soybeans to China, or one of every four rows of soybeans, annually, according to the American Soybean Association, an organization of soybean producers. Trade tensions with China and higher import taxes on U.S. soybeans have thwarted imports recently. The U.S. Department of Agriculture has projected that increased 2,4-D use due to the Enlist system would likely increase the amount of the weed killer sprayed between 200 and 600 percent by 2020. Already, it’s one of the most commonly used herbicides in the United States, used in conventional agriculture including corn and is one of the most commonly used home and garden herbicides. In 2016, the USDA estimated that farmers used 44.4 million pounds of 2,4-D on crops across the U.S.
“This is just going to absolutely be a disaster,” said Nathan Donley, a senior scientist at the Center for Biological Diversity, a nonprofit organization that works to protect endangered species. 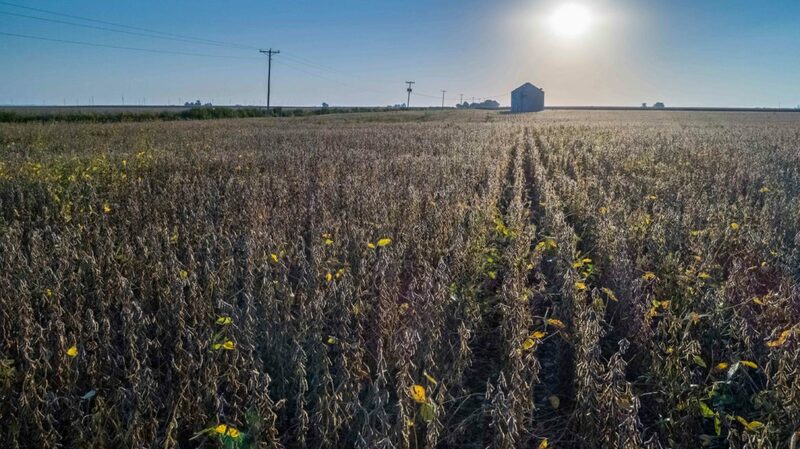 The Enlist approval gives farmers looking to manage glyphosate-resistant weeds a new tool at a time when the dominant soybean system – Monsanto’s Roundup Ready 2 Xtend soybeans – has caused widespread issues in the Midwest and South. Those soybeans are genetically engineered to withstand being sprayed by dicamba, a volatile herbicide that has drifted off target and damaged millions of acres of non-resistant soybeans, other crops and natural areas since the U.S. EPA approved new versions of the weed killer for use on soybeans in November 2016. More than 90 percent of soybeans grown in the United States are genetically modified, but there are only three major systems that are commonly used to combat glyphosate-resistant weeds: Monsanto’s Xtend, DowDupont’s Enlist and BASF’s LibertyLink soybeans, which are resistant to glufosinate, another herbicide. Enlist soybeans can also be sprayed with glufosinate. The extent to which 2,4-d-resistant soybeans will be planted is unknown, largely because of the widespread market penetration by dicamba-resistant soybeans. Company officials estimated the product will have at least 10 percent market share by 2020, which would be about 9 million acres in the United States. In two years, dicamba went from being sprayed on zero acres of soybeans to more than 40 million acres. Aaron Hager, an associate professor at the University of Illinois, said many farmers have adopted Monsanto’s Xtend soybeans as a protection measure against drift from dicamba. “It’s going to be difficult for (Enlist) to gain market penetration partially because of how well entrenched dicamba already is,” Hager said. The main question for farmers considering Enlist is whether drift from dicamba will damage Enlist soybeans, said Charles Benbrook, a visiting professor at the University of Newcastle who has spent decades studying pesticides at various institutions. “One of the huge questions is, is there any cross resistance? Will they be any less vulnerable to damage from drifting dicamba and vice versa?” Benbrook said. Benbrook said they may be able to coexist. Though 2,4-D and dicamba are different pesticides, their similarities might allow some cross-resistance in genetically modified soybeans, Benbrook said. Both dicamba and 2,4-D have been used for decades on other crops but at a smaller scale. Both are broadleaf herbicides that kill plants in similar ways, mimicking natural plant hormones called auxins and causing abnormal growth. Like the new version of dicamba, the new 2,4-D strain approved for usage on soybeans is designed to be less volatile than past versions. If there is no cross-resistance, Benbrook projected that Corteva, a division of DowDupont, and Bayer, which owns Monsanto, will likely have to come up with a deal to put the resistant genes in both company’s systems, increasing the price for farmers. Donley said both herbicides, having similar modes of actions and a propensity to drift, will insert an element of doubt on what caused drift damage. States across the Midwest and South have received a record number of pesticide misuse complaints from farmers since dicamba was allowed on soybeans. Already, some scientists have speculated that 2,4-D is causing some of the alleged dicamba damage. Environmental groups argue the transition to 2,4-D-resistant soybeans, and the increased spraying that goes along with it, is indicative of the problems with industrial agriculture. Jennifer Sass, senior scientist at the Natural Resource Defense Council, an environmental advocacy group, has researched the human health effects of 2,4-D, and said that the herbicide can cause disruptions in the endocrine system. She said that the link to cancer isn’t quite as established. Though 2,4-D is considered a “possible carcinogen,” the research isn’t quite as strong, but that’s because of the difficulties in collecting data, she said. “Those are all data and red flags, but there’s so many reasons to get off this treadmill. Waiting for more confidence in the cancers means waiting for more farmers and pesticide applicators to get cancer, and I don’t think anyone wants to collect our data that way,” Sass said. In some places, some types of glyphosate-resistant weeds, like Palmer amaranth, are already becoming resistant to 2,4-D and dicamba. Bill Freese, a senior scientist at the Center for Food Safety, which is a nonprofit group focused on the environmental effects of food production, said, in addition to human health issues, more spraying will lead to environmental issues, like the killing of pollinators and wild plants, he said. Donley, at the Center for Biological Diversity, has documented those problems with glyphosate and dicamba, especially when it comes to monarch butterflies and milkweed. He said more spraying will lead to more resistance and new herbicides.